The Panthers close with a 10-3 run and improve to 10-3 with a 50-45 victory. 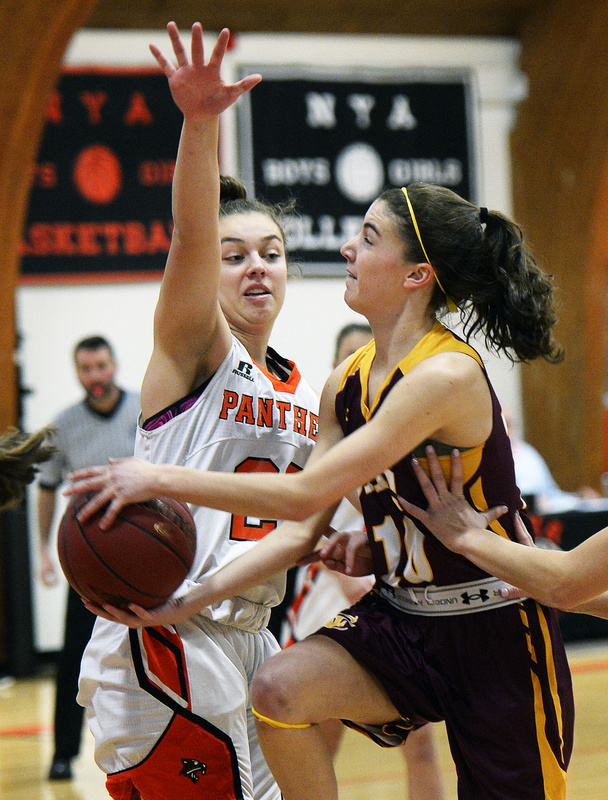 YARMOUTH — The North Yarmouth Academy girls’ basketball team saved its best for last Wednesday against Cape Elizabeth. Trailing by two points with less than five minutes to play, NYA got a clutch 3-pointer from Katie Larson to go on top to stay and went on to a 50-45 victory. A basket by Catherine Reid and another Larson 3-pointer helped the Panthers secure the win and improve to 10-3. Catherine Reid of NYA drives against Brooke Harvey of Cape Elizabeth. Reid scored 22 points as the Panthers won for the seventh time in eight games. Reid finished with 22 points, five steals, five rebounds and two assists. Cape Elizabeth shot out to a 12-4 lead, taking advantage when NYA’s Serena Mower picked up three fouls. Five points from Isabel Berman helped the Capers grab the lead, but NYA began to show signs of life late in the first quarter, pulling within 12-8 when Reid drove for a layup. Reid scored 10 points in the second period, helping NYA take the lead. Cape Elizabeth’s Brooke Harvey drives to the basket as Serena Mower tries to block the shot. 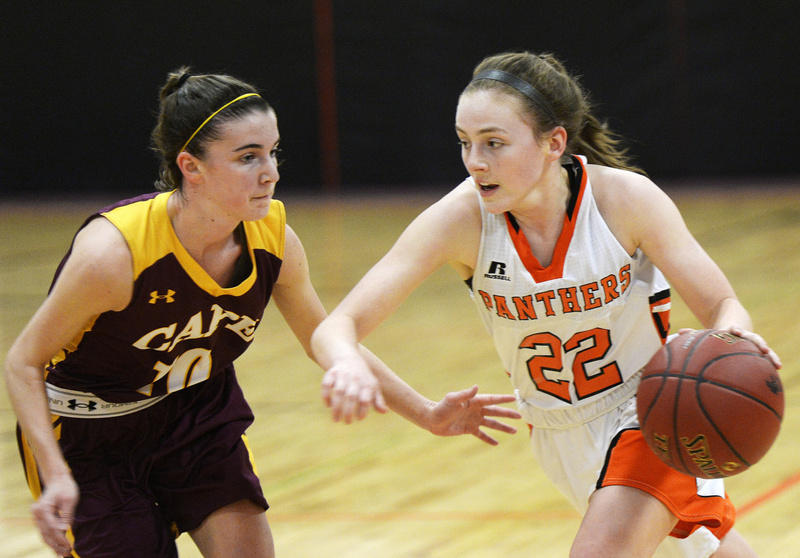 Cape Elizabeth led 16-9 after a putback by Alison Ingalls and 22-17 after a 3-pointer by Jessie Robicheaw, but the final six points of the first half went to the Panthers. Reid and Helen Hamblett scored on putbacks, and a Reid runner off the glass made it 23-22 NYA at halftime. The back and forth continued in the third quarter. The Panthers rode an 11-5 run, highlighted by two Mower baskets and a Maggie Larson 3, to lead 34-29. 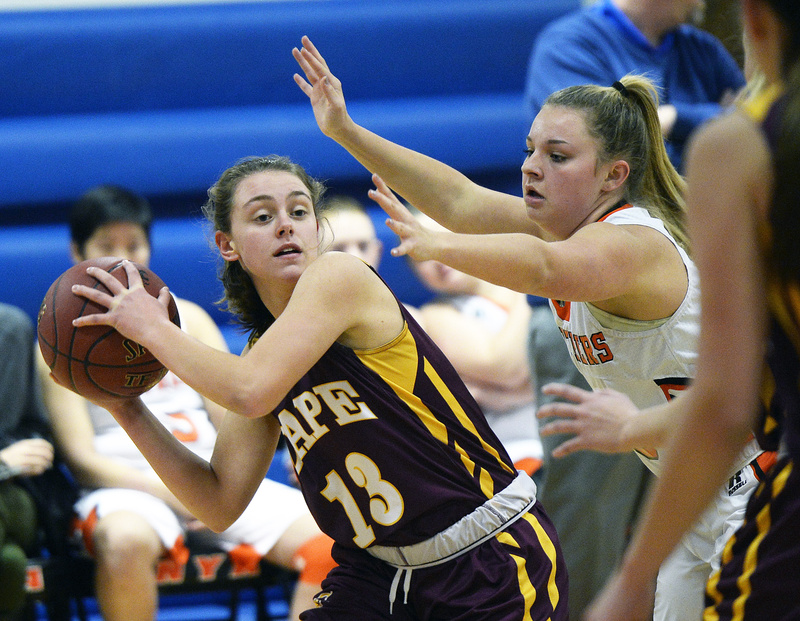 But Cape got a three-point play and a 3-point shot from Isabel Berman to go up by a point. Hamblett then hit a jumper and Reid made a layup to put NYA ahead 38-35 going to the fourth. Then, Reid hit a layup, but Berman made a 3, Ingalls drained a jumper, and a layup from Brooke Harvey gave Cape Elizabeth a 42-40 lead with 4:56 to play. That set the stage for Katie Larson to put the Panthers on top to stay. Reid made a basket after a steal, and with 3:05 remaining, Larson drained a long 3 to effectively put it away. Cape Elizabeth’s Isabel Berman looks for an open teammate as Katie Larson of North Yarmouth Academy applies the defensive pressure. Larson finished with nine points, Hamblett had eight, and Sydney Plummer added nine rebounds and three blocked shots off the bench. Berman paced the Capers (6-8) with 16 points, while Harvey scored eight. Cape is 2-4 in its last six games, all decided by nine points or less. 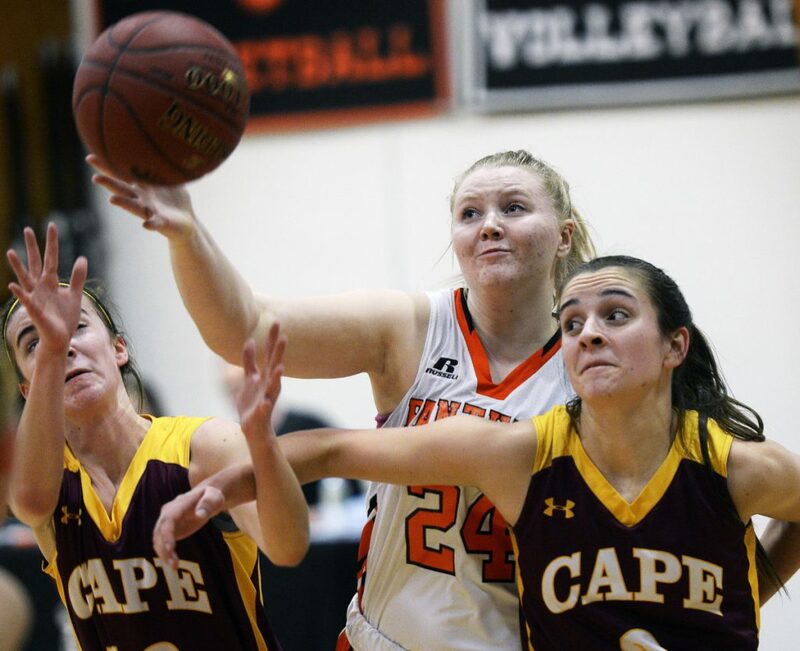 “The girls worked hard, but unfortunately, we didn’t take care of the basketball, and I think that was the difference,” said Cape Elizabeth Coach Chris Casterella.